This bridge is one of only six aluminum girder bridges in the United States, and the only one in Maryland. Despite its ordinary appearance, the bridge is a remarkable feat of engineering with worldwide significance. The Sykesville Bypass Bridge stands today as it was originally built. It is two lanes wide and 294 feet long. Three girder spans composed of triangular aluminum box beams are supported by two piers and two abutments of reinforced concrete. 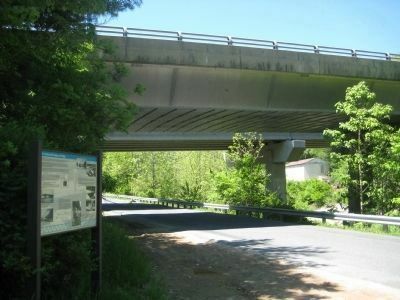 Among its other unique characteristics, the Sykesville Bypass Bridge is the longest aluminum triangular box beam girder bridge in the world. 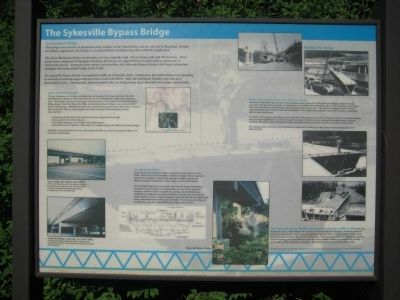 The Sykesville Bypass Bridge was opened to traffic on 17 October 1963. At that time, the United States was expanding its network of roads through combined federal and state efforts. Steel, the traditional building material, grew increasingly scarce. Consequently, interest turned to the use of aluminum as an alternative for bridge construction. Aluminum is lighter than mild structural steel but comparable in strength. It has excellent corrosion resistance. It has high toughness, even in frigid winter temperatures. The higher costs of aluminum, however, discourages its wider use; only six aluminum bridges were built in the United States. 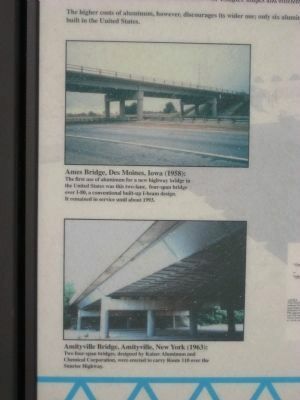 Great advances in aluminum bridge construction occurred in the early 1960s. Referred to as the Fairchild or Unistress Design, the new approach adapted the principles of aircraft fabrication to bridge construction, taking advantage of aluminum's light weight and ease of fabrication. concrete girders in a bridge, the Fairchild Design employed an unconventional system of hollow-triangular box-beam girders joined together to form a single, enormous structural unit that was lightweight, strong, and easily manufactured and assembled. But because of the high cost of aluminum, only three Fairchild Design bridges were erected. Based on the Fairchild Design, the 35-foot wide aluminum girder system of the Sykesville Bypass Bridge is composed of nine alternately inverted, hollow, triangular box beams that were prefabricated and lifted into place on site. The beams, each 67-inches deep, were formed from 0.091-inch thick rolled aluminum sheets and extrusions. The individual triangular beams were then connected side-by-side to form the main structural element of the bridge, a huge composite trapezoidal beam that is remarkably light yet enormously strong. The girder system supports the bridge's concrete slab deck. The concrete slab was poured in place on top of a corrugated aluminum sheet running longitudinally on top of the triangular box beam. When the concrete hardened, the bridge became a composite structure. The concrete deck and aluminum beams, although composed of separate elements, act as a single structural unit. components was 6061-T6, a widely used, corrosion-resistant alloy that is still used today. 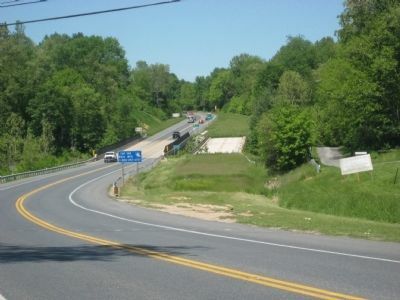 The Sykesville Bypass Bridge was closed to vehicular traffic in 2004 after four decades in service. Interestingly, the reasons for its closure relate to the more traditional materials used, steel and concrete, rather than the aluminum structure itself. Leaking roadway joints causes premature deterioration of the concrete bridge piers. Galvanic action, where the aluminum structure and steel bearing pads were allowed to come into direct contact, contrary to specification, cause deterioration of the aluminum components. These problems led to the closure of the bridge. Location. 39° 21.723′ N, 76° 58.008′ W. Marker is near Sykesville, Maryland, in Howard County. Marker is on River Road 0.1 miles east of Main Street (Maryland Route 851), on the right when traveling east. Touch for map. Marker is just beyond the overpass of the bridge. Marker is in this post office area: Sykesville MD 21784, United States of America. Touch for directions. 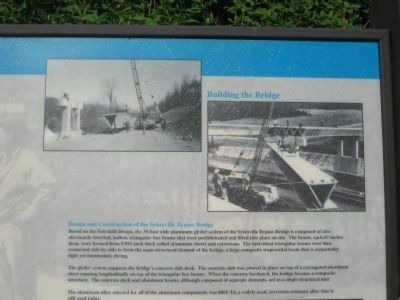 The closer bridge seen here is the Sykesville Bypass Bridge, the subject of this marker. The bridge behind it now carries MD 32 over River Road and the Patapsco River (hidden beyond the bank on the right). (approx. half a mile away); Springfield Presbyterian Church (approx. 0.9 miles away); Henryton School of Practical Nursing (approx. 2.9 miles away); Henryton Center (approx. 2.9 miles away); Hood’s Mill (approx. 3 miles away). Touch for a list and map of all markers in Sykesville. If you use River Rd. (off of 32) to get to the bridge, it makes for a nice scenic drive along the river on approach. Adds about 10 minutes of travel. — Submitted December 28, 2012, by Andy P of Ellicott City, Maryland. The original aluminum bypass bridge is on the right. More. 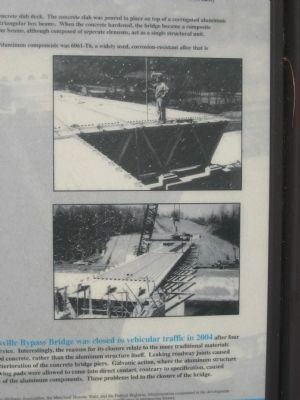 Search the internet for The Sykesville Bypass Bridge. Credits. This page was last revised on August 6, 2018. This page originally submitted on May 20, 2009, by F. Robby of Baltimore, Maryland. This page has been viewed 6,647 times since then and 91 times this year. Last updated on March 16, 2018, by Craig Baker of Sylmar, California. Photos: 1, 2, 3, 4, 5, 6. submitted on May 22, 2009, by F. Robby of Baltimore, Maryland. • Andrew Ruppenstein was the editor who published this page.